Press the Control / Ctrl key while you click on each separate message in your Outlook mailbox that you want to forward. 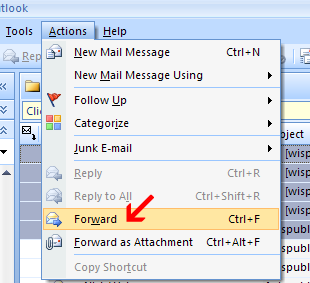 If you're using Outlook 2010: On the ribbon, on the Home tab in the Respond group, click the Forward icon. Just add a subject line and the address of the person to which you're sending it, and click the Send button. On the recipients’ end, your forwarded messages can be read by clicking the title of each attachment. Hat tip to J. D. Biersdorfer at the Personal Tech column of the New York Times.